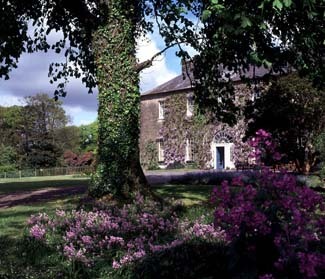 Ireland’s most famous country house, Ballymaloe was one of the first to open its doors to guests when Myrtle and her husband, the late Ivan Allen, opened The Yeats Room restaurant in 1964. Rooms 29 (5 ground floor, 1 single, 3 family, 2 wheelchair friendly, 2 shower only, all no smoking). B&B from €100-150pps low-high season, ss €30. SC discretionary. Room service (limited hours). No lift. Self-catering accommodation also available (details from Hazel Allen). Seats 110; B'fast 8-10.30am daily, L daily 1-2pm, D daily 7-9.30pm (Sun 7.30-8.30pm); set D €75, set L €40; Buffet meals only on Sundays. House wine from €24. Service discretionary. Reservations essential. Children welcome before 7pm (high chair, children's menu). House closed 24-26 Dec, 4 weeks Jan-Feb. Helipad. Amex, Diners, MasterCard, Visa. Accommodation followed in 1967 and since then a unique network of family enterprises has developed around Ballymaloe House - including not only the farmlands and gardens that supply so much of the kitchen produce, but also a craft and kitchenware shop, companies producing chutneys, sauces, soups and ready meals, the Crawford Gallery Café in Cork city, and Darina Allen’s internationally acclaimed cookery school. Yet, despite the fame, Ballymaloe is still most remarkable for its unspoilt charm: Myrtle - now rightly receiving international recognition for a lifetime’s work “recapturing forgotten flavours, and preserving those that may soon die”- is ably assisted by her children, and now their families too, most notably her daughter-in-law Hazel Allen, who is the General Manager. The house, modestly described as “a large family farmhouse”, is indeed at the centre of the family’s 400 acre farm, but with over thirty bedrooms it is a very large house indeed, and one with a gracious nature. 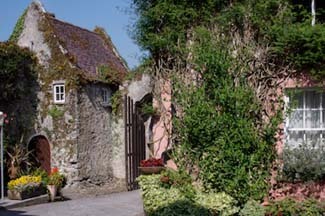 The intensely restorative atmosphere of Ballymaloe is remarkable and, although there are those who would say that the cooking is ‘too homely’, there are few greater pleasures than a fine Ballymaloe dinner followed by a good night’s sleep in one of their thoughtfully furnished country bedrooms - including, incidentally, Ireland’s most ancient hotel room which is in the Gate House: a tiny one up (twin bedroom, with little iron beds) and one down (full bathroom and entrance foyer), in the original medieval wall of the old house: delightful and highly romantic! And then there is breakfast. In the morning the Yeats Rooms restaurant is transformed, with cheery blue and white checked tablecloths and napkins setting the scene for a feast that will start the greyest day on a high. 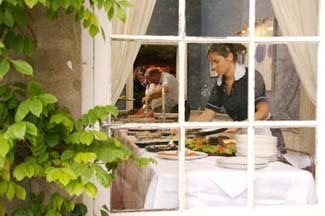 Like every meal at Ballymaloe, 'fresh, local and seasonal' is the philosophy. The buffet offers porridge, made with Macroom stone-ground oatmeal, Bircher muesli made with their own apples, seasonal fruit compotes and home-made yoghurt from the cookery school. Fresh breads - Ballymaloe brown yeast bread, traditional Irish soda breads, spotted dogs and scones - are accompanied by homemade butter and preserves, and the hot cooked to order options include the traditional cooked breakfast made with Ballymaloe farm eggs, bacon and sausages. Honey is from their own hives - and even the coffee is hand- roasted on site by The Golden Bean, which operates in a farm building near the Ballymaloe shop and café. 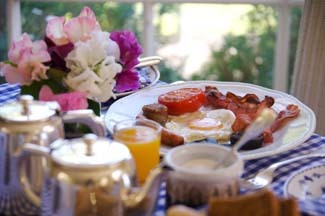 This wonderful breakfast experience says a great deal about Ballymaloe. There is always something new at Ballymaloe – most recently it has been conversion of courtyard outbuildings to create stylishly rustic self-catering accommodation, and the opening of The Grainstore, a wonderful venue for music events that can also be used for weddings and private parties, or even ‘lectures’ (Mary Dowey weekend wine courses, for example). Ground floor courtyard rooms are suitable for wheelchairs. Conferences/banqueting (50-150), free broadband wi/fi. Children welcome (cot available; baby sitting arranged). Dogs permitted (no charge). 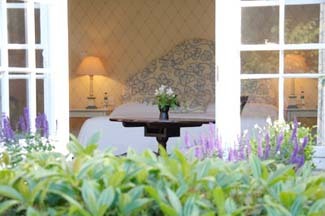 Massages/beauty treatments; Outdoor swimming pool, tennis, walking; golf & equestrian nearby. Gardens. Shop. The restaurant is in a series of domestic-sized dining rooms and guests are called to their tables from the conservatory or drawing room, where aperitifs are served. A food philosophy centred on using only the highest quality ingredients is central to everything done at Ballymaloe, where much of the produce comes from their own farm and gardens, and the rest is sourced from the local producers that Myrtle Allen and other members of her family have championed for over half a century. Joint head chefs, Jason Fahey and Gillian Hergarty continue the house tradition of presenting simple, uncomplicated food in the ‘good country cooking’ style, which allows the exceptional quality of the ingredients to speak for themselves. This is seen particularly at Sunday lunchtime when - apart from the huge range of dishes offered - the homely roasts and delicious vegetables are as near to home cooking you are ever likely to find in a restaurant, and what a joy that is. Then things move up a number of notches in the evening, when daily 7-course dinner menus offer more sophisticated dishes, including vegetarian options, but there is still a refreshing homeliness to the tone which, despite very professional cooking, presentation and service, is perhaps more like a dinner party than a smart restaurant experience. Ballymaloe brown bread; French peasant soup; a selection of their own patés and terrines served with brioche and home-made chutney; grilled Ballycotton cod with prawns, sauce beurre blanc & garden sea kale; Irish farmhouse cheeses with home-made biscuits; and an irresistible dessert trolley that includes country sweets like rhubarb comp&ocirc;te, and home-made vanilla ice cream are typical of simple dishes that invariably delight. 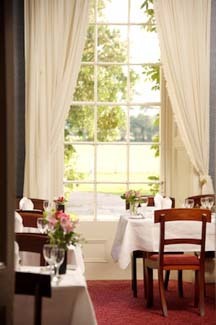 The teamwork at Ballymaloe is outstanding and a meal here is a treat of the highest order. Finish with coffee or tea and home-made petits fours, served in the drawing room - before retiring contentedly to bed. And, then there is the wine: a wine cellar and list that has built up gradually over 45 years and developed into a holistic wine experience. It all began with the late Ivan Allen, when he and Mrs Myrtle Allen opened Ballymaloe in 1964 (a year marked on the current wine list by Chateau Canon 1964); since then a number of equally dedicated and knowledgeable people have developed the wine offering and – in tune with the educational philosophy of Ballymaloe as a whole – wine events are now held on an almost weekly basis throughout the year, including visits by many guest experts such as the enormously popular twice-yearly intensive wine weekends with wine writer Mary Dowey – now held in Ballymaloe’s beautiful music and events venue, The Grainstore. The list itself remains a work in progress and, with at least ten ‘house recommendations’ plus many other more specialised choices by the glass, an accessible one at that. An experience to be savoured. Children are welcome at lunchtime, but the restaurant is not suitable for children under 7 after 7pm. (Children’s high tea is served at 5.30.) Buffet meals only on Sundays.